Michael J McDonagh was at the Celebrations for the Rising in Dublin 50 years ago in 1966. 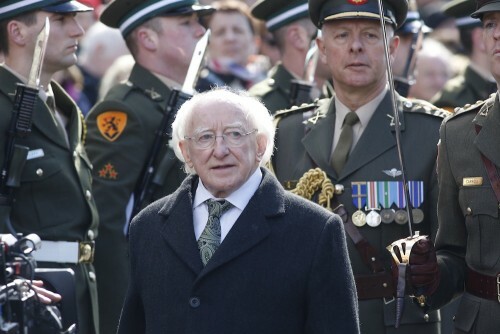 He went back for the Irish World for last weekend’s centenary commemorations. Walking around Dublin fifty years on from the last time Ireland celebrated the dramatic events that led to Ireland becoming an independent state it is clear that so much has changed. Not just the obvious physical changes with all the new glass office towers, luxury hotels, shopping malls and apartment blocks (there was no such thing as a ‘luxury’ apartment in 1966) but a tangible profound change in the mood, attitude, culture and wellbeing of people. 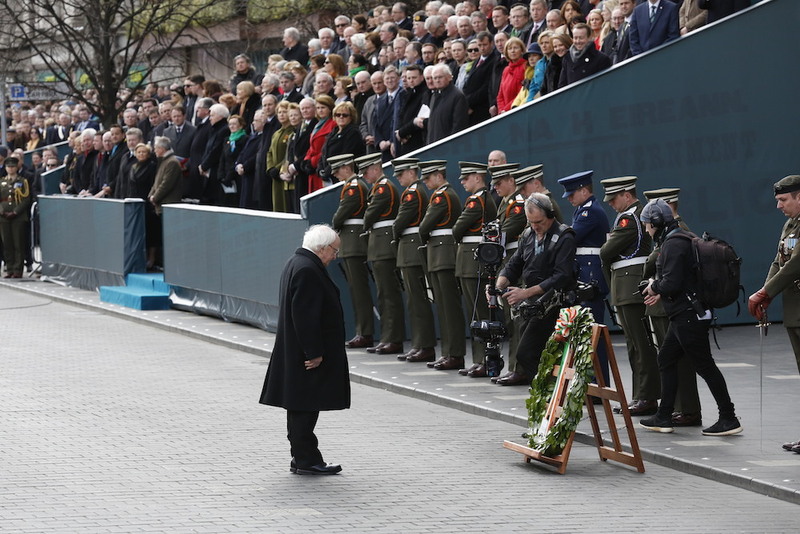 For Easter 2016 Ireland went to enormous trouble to organise an ambitious programme of events and commemorations – not celebrations – that, as the acting Taoiseach Enda Kenny said convey ‘respect and dignity’ to the history. It was a much more nuanced view that was more inclusive and balanced way than 50 years ago. A nation is defined to the world by the way that it stages these grand historic occasions. Every credit should be given to the teams from various government departments who used this opportunity to put today’s Ireland on the world stage as a dynamic country of peace, and for avoiding the triumphalism and naïve, simplified, notions history that set the tone for the occasion 50 years ago. President Higgins and caretaker Taoiseach Enda Kenny showed deep respect and appropriate gravitas at the wreath laying ceremony outside the GPO on Easter Sunday. They also showed great skill and a delicate balance in focusing more on the lasting ideals of the Proclamation than just the armed rebellion of Easter week 1916. A particularly emotional moment was when children from all the provinces of Ireland came forward, with a piper playing a lament, to place flowers at the GPO. This resonated with the thousands who lining the streets and watching on big screens. (Of course there were none of those in 1966). Now, in 2016, the innocent Dubliners killed, directly and indirectly, as a consequence of the Rising were at last remembered, especially the forty children killed in crossfire. Collateral damage was an unknown euphemism fifty years ago and even a hundred years ago. The 200,000 Irishmen, who in 1916 were fighting in the First World War, encouraged by Redmond to enlist in the British Army, and the crucial role of women, were all also acknowledged in this non trivialised complex narrative. That certainly did not happen in 1966, when Sean Lemass may have been Taoiseach but Eamon De Valera was President and, working hand in glove with Archbishop McQuaid, did what he could to hold Ireland to his narrow vision. But today we have a nation that welcomes the world and, after the historic visit of the Queen in 2011, enjoys a relationship with Great Britain like never before. 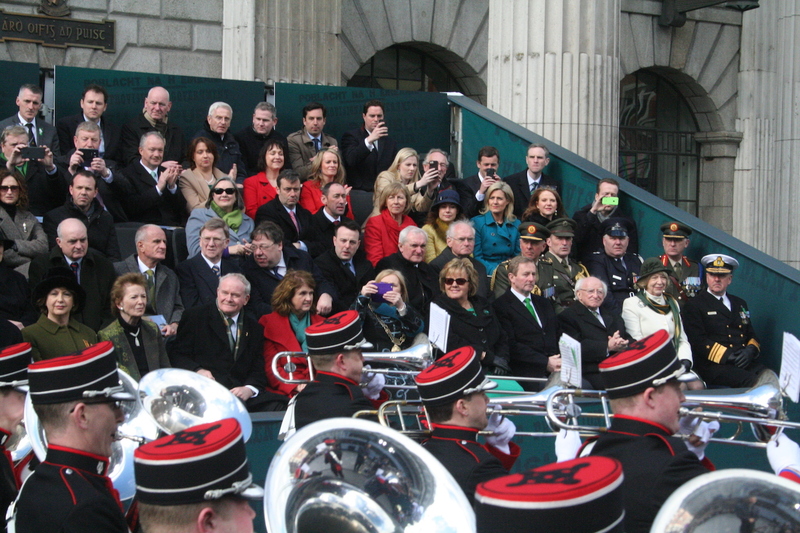 Part of the agenda for these Commemorations was an initiative in all the schools of Ireland to involve children in the history of the Proclamation and to explain that the colours of the National Flag are Green for nationalist Ireland, Orange for the Protestant tradition and especially for its dissenters like Wolfe Tone and the United Irishmen, and White for peace in unifying those traditions. Not as they were described in 1966, in an attempt to airbrush history, ‘green, white, and GOLD’. Mr. Kenny, who still harbours hopes of being re-elected Taoiseach on 6 April if he can get enough support from non-aligned, independent TDs (almost unthinkable fifty years ago) said: ‘Cherish the principle and ideals of the Proclamation’, to show Ireland to be a nation of peace, looking forward to the next hundred years. In 1966 I arrived in Dublin, straight off the night ferry, as a student on Good Friday in 1966. Myself and a friend slept in a cell in Store Street Garda station on our first night, because the youth hostel was full and a kindly garda, whom we stopped to ask advice on where we might stay, gave us a cell as long as we were out before the sergeant came in on duty the next morning. He even woke us with a cup of tea. 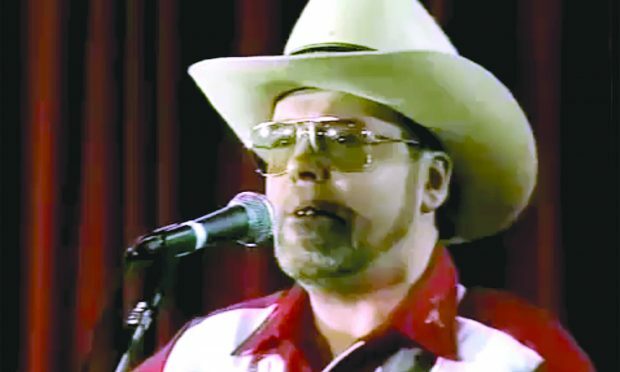 It was a simpler time, certainly. Before the official programme of events I walked around, for about eight miles the first day and twelve miles the next, retracing the footsteps of history around the key locations of the rising. 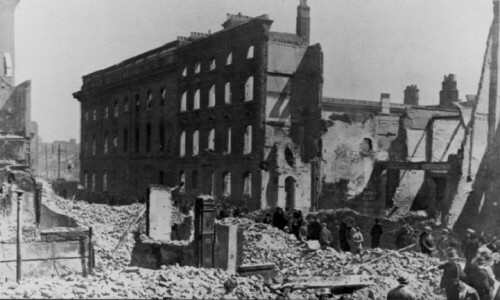 A hundred years ago, as photographs show, it was ravaged by the destruction caused on Easter Monday 1916 when a small group of nationalist idealists, boldly marched in to occupy key buildings, such as the General Post Office and The Four Courts. The radical Proclamation document declaring a Republic, signed by the seven leaders, was posted on the GPO leading to the arrests, courts martial, executions at Kilmainham Gaol and consequences we all know so well. 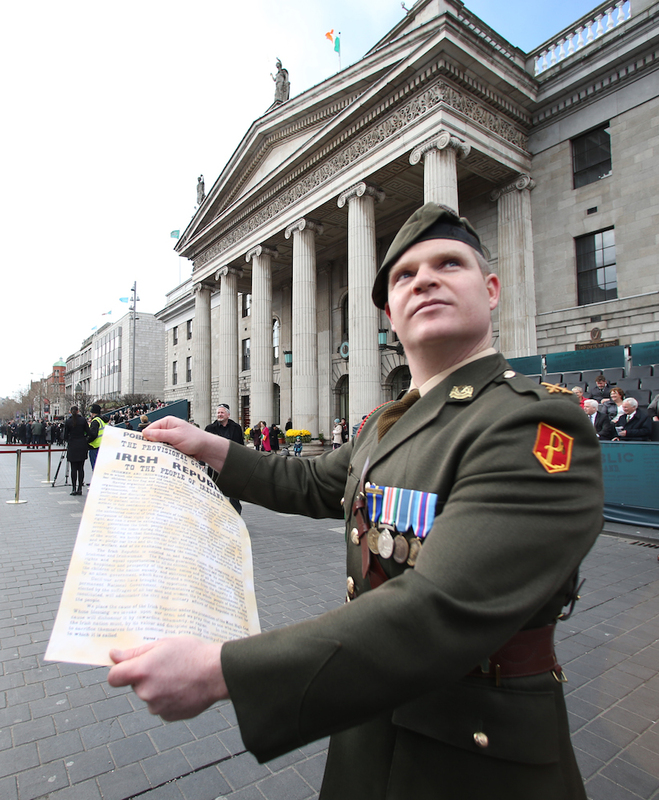 Pearce succeeded in getting ‘blood sacrifice’ he so wanted and accomplished his goal of becoming a martyr for Ireland. 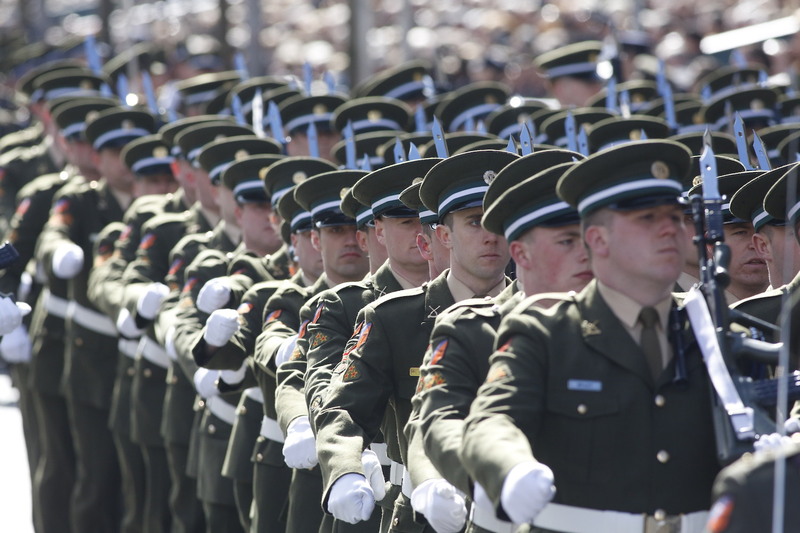 The surprise Bank Holiday coup astonished the people of Dublin, and the British Establishment, which ruled the country from Dublin Castle and the 200,000 Irishmen fighting in the British Army. It did not, then, at least, have popular support with and this isolated gesture was doomed to military failure, especially as so few (1,200) Volunteers turned out after MacNeil ‘cancelled’ the orders. Britain brought in thousands of extra troops, sailed the Helga gunboat up the Liffey and blasted the rebels out of the GPO and most of the other strategic buildings they had occupied. Everything changed, changed utterly as Yeats so famously wrote. On my walk this Easter there were still some fine Georgian buildings not destroyed by the shells or, even after that, Ireland’s native politicians and property developers who destroyed so much of Dublin’s architectural heritage in the intervening years. Alas, there was not a trace of O’Meara’s Irish House, a once beautiful Dublin pub recalled from fifty years ago and, of course, no Nelson’s Pillar, blown up in March 1966). 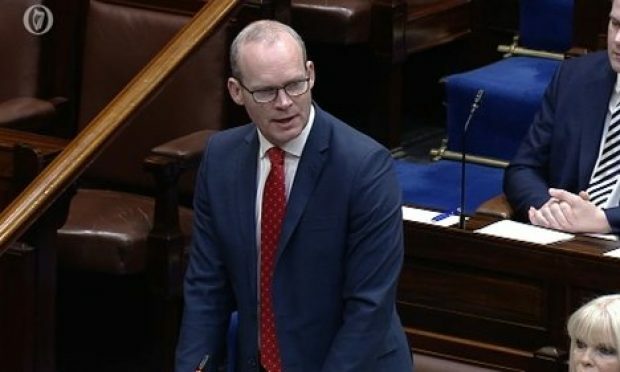 What is clear though, is that over the last forty years the obvious poverty of the tenements, that had made Dublin’s slums the worst in Europe in 1916, have gone. Now it is very much a bustling cosmopolitan European city full of shops, cars and people going about their business in these much less claustrophobic post Celtic Tiger years. I wandered around Little Mary Street, where my relatives lived, up to Moore St and the place from which the leaders sent out Nurse Elizabeth O’Farrell with a white flag to surrender, or the place where O’Rahilly died in Moore Lane. Some of these narrow back lanes were much the same as it must have been then and, as I stepped over dead rats and rubbish, I felt the whole area should be preserved for future generations as poignant reminder of their bravery and as a historic site. It was still nostalgic though to be able to get a slight smell of burning turf, which in 1966 was the dominant smell when we came off the boat at North Wall, as was the smell of bacon and black pudding frying. But back then there was still very real poverty in the multi-occupied houses around the back of Gardiner St or near Mountjoy square. 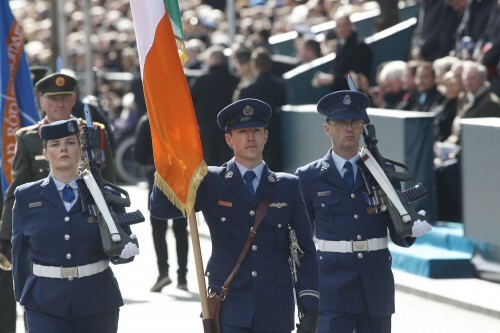 The huge parade on Easter Sunday, with the a wreath being laid in the name of the Irish people, was the biggest ever staged in Ireland and featured lines and lines of marching men, this time not Connolly’s Irish Citizen Army, or the Volunteers, but 3,500 members of the Irish Defence Forces who these days have a fine reputation as peacekeepers throughout the world. They were joined by members of blue light services, the Fire Brigade, Ambulance, Civil Defence and even the Royal National Lifeboat Institute, that carried on saving lives, with Royal patronage, around the coast of the island throughout the war of Independence, the civil war, and the Second World War, through to today. 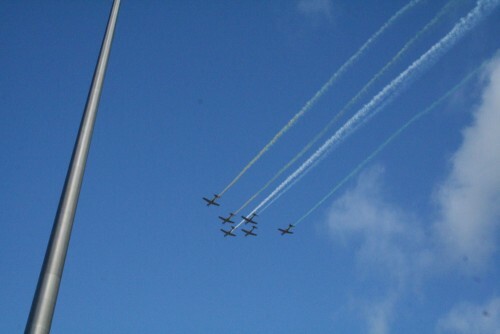 It was a magnificent parade that even featured a fly past by Ireland’s Air Corps. Indicative of how much time has passed and what progress has been made was the sight of Martin McGuinness, Sinn Fein’s Deputy First Minister of Northern Ireland, sitting next to former President Mary Robinson, applauding the Prison Officers’ band and Garda bands as they marched by. Two incidents made me smile. In the queue for Kilmainham Jail, about a four hour wait, there was a party of about five very English, very middle class, women in their twenties. They all looked well-dressed and like they had good jobs and had booked a girlie Easter weekend in Dublin unaware of what was going on. 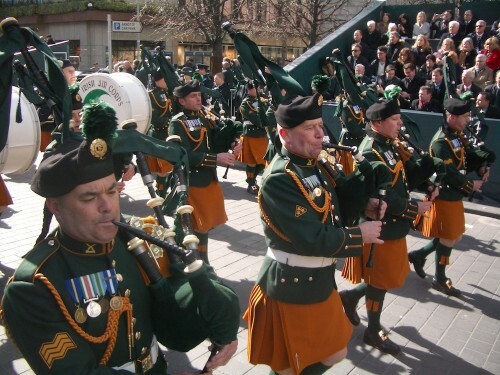 Opposite the long line of waiting tourists Sinn Fein President Gerry Adams was assembling his alternative parade/march to Arbour Hill but nobody – nobody at all – was really taking any notice. As it shuffled off with just a few in the parade being ignored by one of the girls asked me what was going on and I said it was just Gerry Adams and his bandwagon. To my amazement she replied ‘Who’s Gerry Adams?’ but I guess this generation does not need to know who he is. On Saturday night, watching Irish TV in bed tired after my hikes around Dublin, I watched a long interview with a transgender actor who was born male and is now a woman. 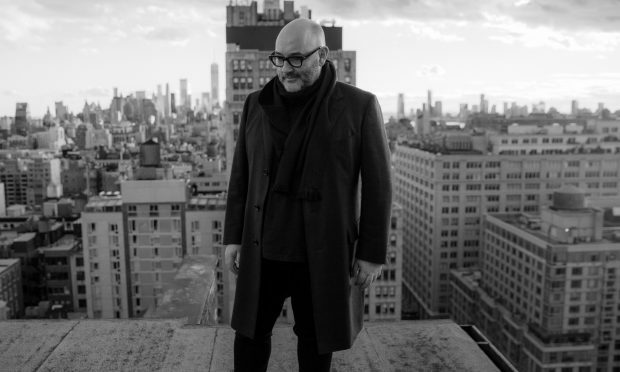 The interview went on for ages, the audience liked her, and I realized how just what seems like only a few years ago in Ireland any public discussion in Ireland – on prime time TV – of being gay or transgender would certainly have been beyond the pale. Immediately afterwards, on the main TV channel on Saturday night, there was the Easter Vigil at the Capuchin Church. 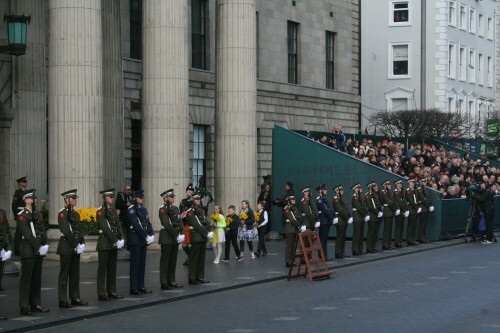 Overall, it was a privilege and honour to be in Dublin for this auspicious occasion fifty years on. I am proud to be part of the Irish diaspora associated with a wonderful country, still not perfect, but now free for creative thought, dreams ambitions peace and prosperity after many decades of long shadows for the generations who followed 1916. But today we are left with an overwhelming feeling of pride, some emotion and a sense of peace for all on the island.